The weather here is a very welcome change to what we have left behind. The skies are a brilliant blue and the sun is shining brightly - exactly the kind of weather that will see Stuart quickly turn into a gorgeous bronzed colour and, if I'm not careful, is likely to turn me into a little red tomato! The good news is that we arrived on a public holiday - Auckland Day - so the harbour was full of boats of all shapes and sizes! A real treat. Early the next day we headed up for the stunning Bay of Islands where we have spent the past two nights. First stop was to see the amazing native Kauri trees - incredible in their age and beauty, but sadly have been over-forested and now very scarce. I have to admit to being somewhat ignorant about the value of the gum that these trees produce - whcih eventually turns into amber. So valuable, in fact, that NZ experienced a 'gum rush' at a point in its history! Second stop was the place where the Treaty of Waitangi was signed in 1840. Well worth a visit - steeped in history and a really good introduction to understanding the Mauri culture. We are very fortunate to be staying right next to where the Treaty was signed - love being so close to an incredible piece of history. It also houses a wonderful golf course with amazing views - the temptation for Stu to play this was great but (somehow!) I managed to keep him away from it! Today we had a fabulous day on the water. Stunning views all around, even though I understand from the locals that today was offically classified as a storm! 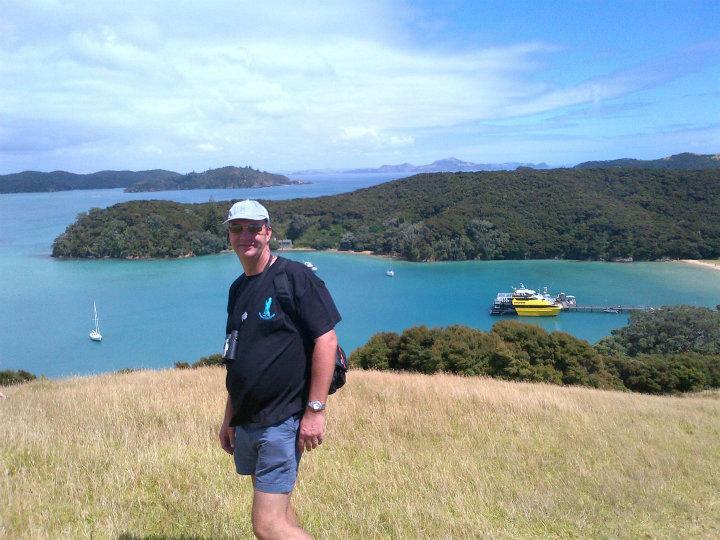 Cruise with lunch followed by a trek around the quaint Russell Island and then back to Paihia for the most fun yet - sea kayaking! Great fun! However, many of you who know me won't be at all surprised to hear that the first person to capsize out of their kayak underneath the waterfall - the only real rapids of the trip - was me! I did manage to take Stuart with me! Oh well, apart from a complete soaking and a bruised pride we both came back in one piece. We decided we had earned a fish and chip supper on the local boat - the "Shippey"! - moored close by where we are staying. The perfect end to a perfect day. Tomorrow we have another morning on a boat before we head back to explore Auckland a little more. Photos will follow - afraid wireless access here is limited to 20 mins only per day!